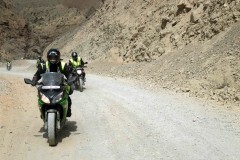 On this 11-day Ladakh motorbiking adventure, you'll visit the famed lakes of Pangong and Tso Moriri, travel to the sand dunes of Hunder, ride through the high-altitude pass of Khardung-La, visit the historic monasteries of Thiksey and Diskit, apart from a range of other exciting adventures. A major highlight of this itinerary, you'll also visit the distant village of Hanle, near the Indo-Tibetan border. Your adventure begins in the lush, green valleys of Manali. 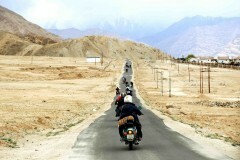 Travelling north on the Leh-Manali highway, you'll reach Leh, the largest city of Ladakh. After exploring the city, you'll travel to the sand dunes of the Nubra Valley and spend a night by the famous Pangong Lake. You'll visit the distant village of Hanle and the multi-coloured Tso Moriri. Driving past the historic town of Kargil, you'll arrive at the state capital of Srinagar, ending the tour with unforgettable experiences. Arrive in Manali and convene at a pre-determined meeting point. In the afternoon, you'll meet your fellow motorbikers and your road captain for a brief orientation session to discuss the climate conditions, itinerary and other details of your upcoming motorbiking adventure. 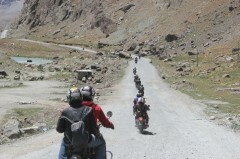 In the evening, test ride your allotted motorbikes in the streets of Manali. Overnight in a hotel at Manali. Manali is easily accessible by road or air. You can board a direct flight to the Kullu-Manali Airport at Bhuntar from most major cities in India or board a bus from nearby cities like Shimla, Chandigarh, Delhi and Ludhiana.